(CNN) -- The Southeast picked up the pieces on Monday after deadly tornadoes tore through the region, killing more people in one weekend than in all of last year. At least 41 twisters ravaged Georgia Mississippi, and Alabama, killing 19 people and destroying homes, CNN meteorologists reported. In 2016, tornadoes left 17 people dead across the country. When the howling winds subsided, the landscape was dotted with overturned cars, debris and scores of damaged mobile homes. Elsewhere, along the Eastern Seaboard and in California, millions were facing potentially disastrous storms Monday as deadly storms continue to churn. Heavy rain and strong winds are also expected across the Mid-Atlantic, with gusts near 60 mph possible in New York City. Flash flood watches were in effect in the Los Angeles area, with small pockets of the region under mandatory evacuation orders after heavy downpours triggered minor mud and debris flows. Storms are blamed for two deaths in California. Across the South, the rough weather gives way to partly cloudy skies and moderate wind on Monday. Georgia Gov. Nathan Deal has declared a state of emergency in seven southern counties, and he said the state will seek federal assistance to help storm-stricken areas. Fifteen people were confirmed dead across the state. "These storms have devastated communities and homes in south central Georgia, and the state is making all resources available to the impacted areas," Deal said in a statement. "You can imagine putting a bomb in a mobile home and having it explode. That's about what it looks like," Adel Mayor Buddy Duke said Sunday of Sunshine Acres, a community of about 60 mobile homes some 200 miles south of Atlanta. Five people remain missing, Duke said. 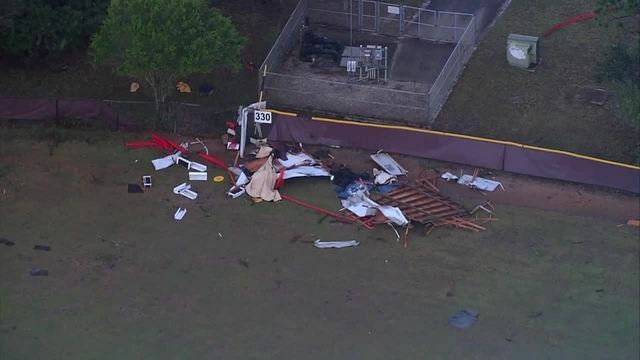 In Georgia's Dougherty County, four people died after a deadly storm believed to be a tornado struck the region Sunday, county coroner Michael Fowler told CNN. The county is located in the southwestern part of the state. As the rain and wind intensified Sunday, the National Weather Service issued a rare "high risk" alert for severe thunderstorms, including strong tornadoes, for south Georgia and northern Florida. The alert, which lasted through Sunday evening, was the first of its kind issued since June 2014. Mississippi Gov. Phil Bryant declared a state of emergency. 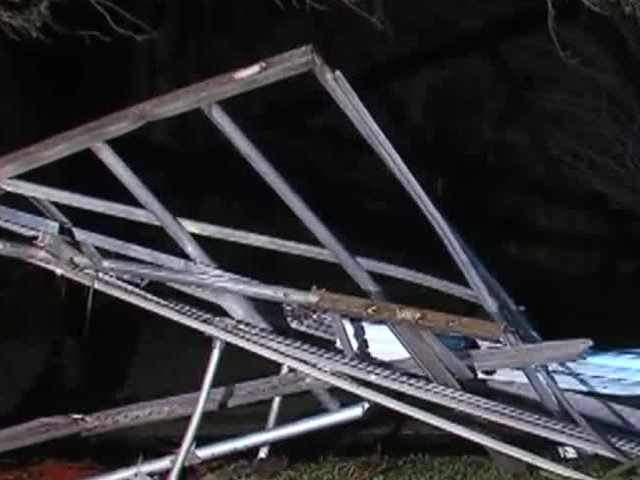 In Alabama, 15 counties reported storm-related damage. Four people were injured in Choctaw County, said Greg Robinson of the Alabama Emergency Management Agency. - A mandatory evacuation has been issued for the Sand Canyon area impacted by the Sand Fire, the Los Angeles County Sheriff's Department said. - A flash flood watch is in effect for the Santa Clarita Valley until Monday evening, the National Weather Service said. - The National Weather Service has issued a flood watch for the Fish Fire Impact Area until Monday evening. - The city has placed 180 homes under mandatory evacuation orders in the Fish Fire Impact Area. - An evacuation warning was issued on Saturday for areas burned in last July's Sherpa Fire, the Santa Barbara County Sheriff's Office said. - A flash flood watch remains in effect throughout the county Sunday into Monday, the National Weather Service said. Meantime, two people are missing off the coast of Pebble Beach, the US Coast Guard said. Officials said they suspended search efforts after nearly eight hours due to deteriorating weather and unsafe conditions. The woman was in bed with her boyfriend sleeping when the tree fell, officials said. The boyfriend survived, along two children in the home. The rains weakened the oak tree, and it's a weather-related death, Bushby said. Authorities in San Diego County are working to recover the body of an adult from a swollen creek, San Diego Sheriff's Department spokesman Ryan Keim told CNN on Sunday. Rescuers are also searching for a child in the creek. "The creek is very swollen with lots of debris," Keim said.